Northwest Arkansas (NWA) is the nation’s sixth fastest growing region. This area of 350,000 is expected to double its population within the next 15 years, growing to more than one million by 2050. Visioning Rail Transit in NWA is the first step in helping NWA to envision smart growth development opportunities through context-responsive transportation planning at the regional scale. 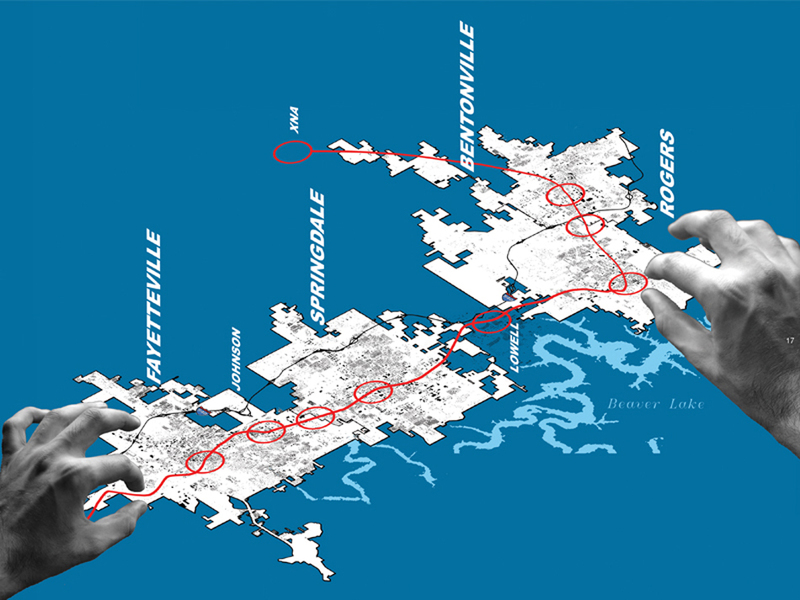 The scenario-based visioning makes the regional scale imageable as a connected, shared living space for the general public. This promotes new forms of cooperation among NWA cities. The study’s goal is to mobilize the financial and political support needed to enroll NWA in the Federal Transit Administration’s New Start program for public transit development.